Conspiracy is one place you don't have to know who is playing - the musician is always good. I haven't heard of Gary's music but he came highly recommended by someone I met at Conspiracy while watching Joey Ayala perform last week. Tonite, he did not disappoint. His style is uniquely his own. 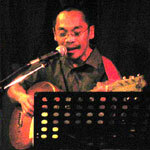 His lyrics were folksy kundiman (at least with the first few songs) but his delivery is jazz. I don't know if he writes his songs but they were witty and funny. He performs every Monday...no cover or minimum charge. Indeed, it's a small world. 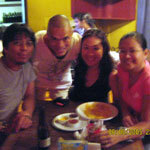 Next to my table was no other than Jong Malabed, the intrepid traveler I met in Batad and later on in Sagada. Apparently, he ventured further into the fiercely-proud Kalinga region into Tinglayan and the other adjacent villages. He will be returning to Kalinga before he leaves for Florida. Just 3 years before, it was a no-man's land with tribal disputes in full swing. It's not advisable to go there without a guide. In the 4 neighboring villages, he met the only surviving tatoo artist. She was in her late 70s with no one taking after her craft. When she dies, her craft dies with her. 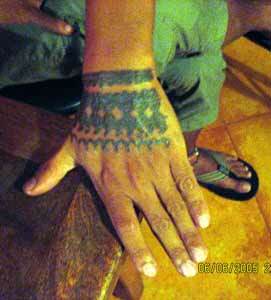 Jong, in a valiant effort to have what may no longer be available in the near future, had his wrist tattoed. The inflamation hasn't fully subsided as of this writing. Like a call of the wild, he will be returning there this July.